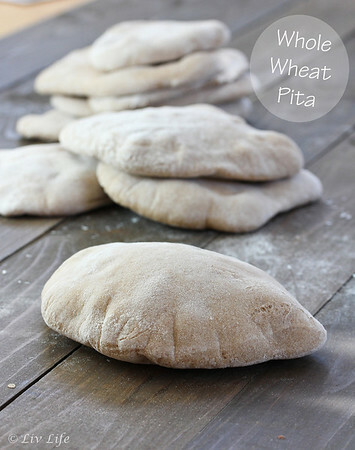 What could be better than a soft pita fresh from the oven? Well... how about if that pita was soft and fresh from your oven?? 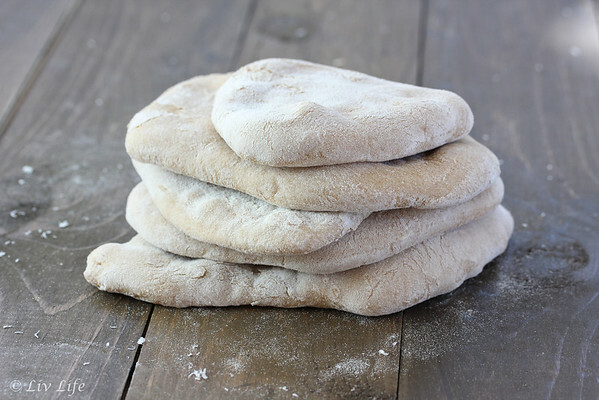 With only 4 ingredients, homemade pita is easier than you think. Adaptable to your tastes, either all-purpose or nutty whole wheat flour can be used with equally successful results, and before you know it, the aromas floating from your oven will draw family members away from their personal tech devices and you'll have smiling faces actually chatting in your kitchen. Well... I can't promise they will put the tech gadgets down, but if they don't it's probably just because they're posting to Instagram (just like I did!). 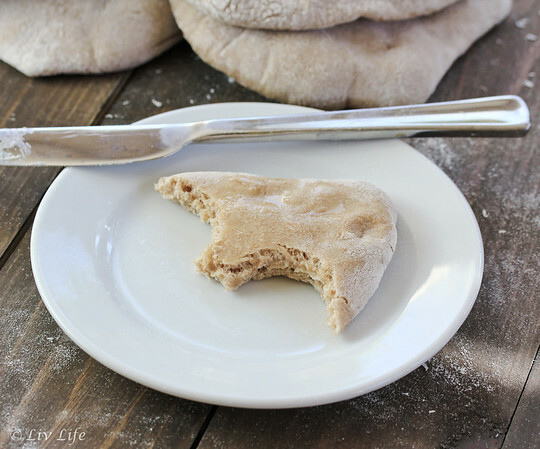 Served warm, pita is a delight with hummus or simply spread with plain ole butter. But the "pocket" in the pita is what makes this bread unique. Whether it be spread with hummus and stuffed with cucumber, arugula, tomato, onion and avocado (my personal favorite), or turned into a ham and cheese pocket, pita makes an ideal meal to go. Make your own, and make them often. You'll never be able to go back to store bought. Adaptable to your tastes, feel free to use all all-purpose flour in place of the whole wheat. Place warm water into the bowl of a stand mixer and add the yeast. Begin mixing with the regular beater on low. Add the salt and 1/2 cup whole wheat flour. Switch to the bread hook, and add another 1/2 cup whole wheat flour. Continue adding flour by 1/4 cups until the dough ball cleans the side of the bowl. Allow to continue mixing for 6-7 minutes. Place dough ball into a lightly oiled bowl, turning once to oil all sides. Cover with a clean dish towel and place in a warm location for about an hour to rise. (Note... if our house is a cold as mine - heat a cup of water in a coffee mug to boiling in your microwave. Keep the steaming water in a corner of the microwave and place the bowl with the dough into the microwave. It keeps the bread nice and warm!). Preheat oven to 425ºF and place a baking sheet in the middle of the oven to heat. Dump the dough onto a well floured surface, and cut into 6-7 pieces. Allow to rest a few minutes, then place one piece in the middle of a board well dusted with flour. Flatten the ball, then roll to about 1/4 of an inch thick. Proceed with remaining pieces. 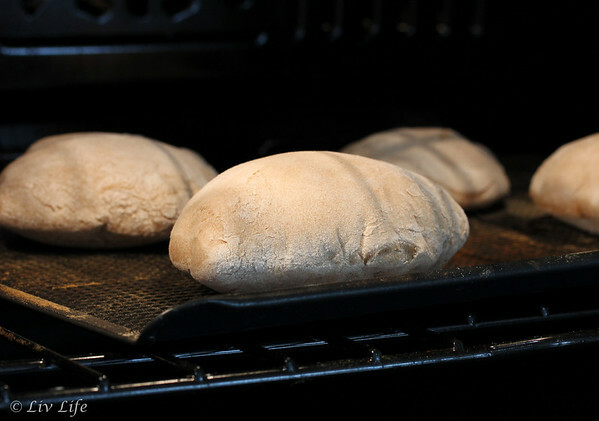 Place the rounds onto the preheated sheet in the oven and bake for about 6 minutes, or until the pita has puffed and is lightly browned. Transfer to a wire rack to cool... or alternatively, eat immediately! Liv Life Note: We make this recipe so often I no longer measure the ingredients... to make a slightly larger batch, place about 1 1/4 water in the bowl, add yeast, 1 cup of all-purpose flour, and the salt and mix. Simply add more flour (either whole wheat or all-purpose) until the dough ball cleans the sides of the bowl. Follow the rest of the directions as above. Oh your fresh warm pitas look great! If I knew how to make them (and wasn't that lazy) I would never buy them. These are easy!!! Let me know if you try... I'm curious what you think!! Well now I just have to try this!! These look amazing. Since 2014 is the year I am going to conquer my fear of yeast, I can't wait to try them. You can do it Felice!! They are far easier than I thought... Let me know if you try!! These look just wonderful Kim, I can think of a zillion things to do with these beauties! Fresh, Fragrant and Delicious... perfect description Krista!! I would love to try this really really soon! The kids always ask for homemade lunches. Usually I am too busy with school but I am finding the time to more and more, HOPEFULLY! These will make a great addition to their school lunches for great sammies! Two reasons that sometimes make my pita's not puff is first I find fresh ground wheat works better than store bought. I use both, but have never had problems with the fresh stuff. Also, I was told never to roll the pitas all the way to the edge. You don't want to force out the gasses that have formed during the raising. That is what makes it puff. Maybe these are both old wives tales, but the work for me. I have never used a cu of all purpose flour. I will try this. Maybe I will have more success with my store bough wheat. Thanks for sharing the recipe!